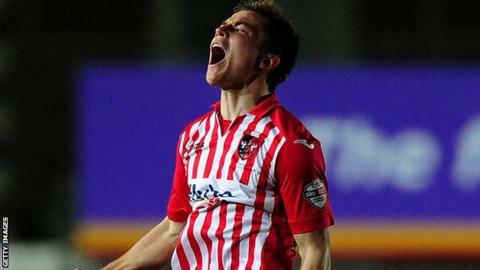 Exeter came back from two goals down to register a famous victory at Luton. Luke Guttridge's early deflected shot and a Mark Cullen goal right on half-time put the Hatters in control. But Ryan Harley hit back with an excellent volley from the edge of the area soon after the break. Jordan Moore-Taylor levelled with 14 minutes to go before David Wheeler prodded in from close range in injury time after Christian Ribeiro had headed Liam Sercombe's header against the bar. Luton were fortunate not to have Steve McNulty and Nathan Doyle sent off towards the end for challenges on Wheeler and Lee Holmes respectively. The win draws Exeter level on points with ninth-placed Luton and the pair are now three points off the final play-off place. "To be 2-0 up and end in defeat was very disappointing. "Let's hope we can claw our way to the play-offs from what's still a decent position for us. "We just need to produce better form and work as hard as we can to get some more points between now and the end of the season." Match ends, Luton Town 2, Exeter City 3. Second Half ends, Luton Town 2, Exeter City 3. Corner, Luton Town. Conceded by Jamie McAllister. Goal! Luton Town 2, Exeter City 3. David Wheeler (Exeter City) right footed shot from very close range to the bottom left corner. Assisted by Christian Ribeiro. Attempt missed. Jayden Stockley (Luton Town) right footed shot from the centre of the box is high and wide to the right. Corner, Exeter City. Conceded by Paul Benson. Corner, Luton Town. Conceded by Arron Davies. Attempt blocked. Cameron McGeehan (Luton Town) right footed shot from outside the box is blocked. Attempt missed. Arron Davies (Exeter City) right footed shot from outside the box is close, but misses to the left. Attempt missed. Lee Holmes (Exeter City) left footed shot from outside the box is close, but misses the top left corner from a direct free kick. Steve McNulty (Luton Town) is shown the yellow card. Substitution, Luton Town. Alex Lacey replaces Lewis Kinsella. Goal! Luton Town 2, Exeter City 2. Jordan Moore-Taylor (Exeter City) right footed shot from the centre of the box to the bottom right corner. Assisted by Clinton Morrison. Substitution, Exeter City. Clinton Morrison replaces Graham Cummins. Substitution, Luton Town. Jayden Stockley replaces Mark Cullen. Luke Wilkinson (Luton Town) is shown the yellow card. Attempt missed. Christian Ribeiro (Exeter City) header from the left side of the six yard box is close, but misses to the right. Substitution, Luton Town. Cameron McGeehan replaces Jonathan Smith because of an injury. Attempt missed. Graham Cummins (Exeter City) header from the right side of the six yard box is close, but misses to the right. Corner, Exeter City. Conceded by Elliot Justham. Attempt blocked. Luke Guttridge (Luton Town) right footed shot from the left side of the box is blocked.